Chivalry is a spellcasting ability of the Paladin, instead of reagents it uses Tithing points. To cast the spells you will also need a Book of Chivalry from an NPC Keeper of Chivalry Lord British's Castle. This book contains not only the 10 Paladin spells but also shows how many tithing points you have. Because Chivalry is by nature aligned with the forces of good, a Paladin who has high karma will find his/her chivalrous powers more effective. Karma can affect both the duration and power of various of the Chivalry abilities. You may tithe gold at any shrine, the ones on the Brit bank are probably the most conveniently located. In Haven it is through the warrior’s training area. One gold piece provides one point of tithing, the spell book will show these points up to a maximum of 100,000. Gold will be withdrawn from your Currency Account in you bank. 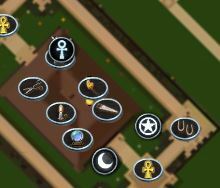 Single click the ankh and in the menu select Tithe Gold Now it will ask how much you wish to donate, using the single > will increase the donation in increments of 100 gold pieces, using the double >> will donate the amount required to reach the maximum 100,000gp. (eg if you already had 2000 tithing points the >> would allow you to donate 98000gp) provided your currency account has sufficient funds. This property is capped at 4 for the use of Chivalry skills, unless the player also has a Magery skill of 70.0 or higher – then the cap is 2. 10 10 0 This is the Paladin’s healing spell, it can heal 7-39 points of damage done to himself or a valid target within 2 tiles. The caster’s Karma affects the amount of damage healed. 10 20 5 Removes all Curse effects from a valid target. 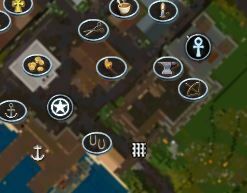 Curses are timed effects shown as red icons in your debuff bar. 10 10 15 The paladin’s weapon is temporarily imbued with the power to do damage against the target’s weakest resist. Duration is affected by the caster’s Karma and lasts for 3 to 11 seconds. 20 20 15 The Paladin’s equivalent to the mage’s recall spell. All restrictions with regard to combat apply. 10 15 25 Refreshes some stamina and gives a boost to swing speed, hit chance and damage dealt for a few seconds, but at the cost of the caster’s defence chance. 10 15 35 Attempts to dispel evil summoned creatures and cause monsters to flee from combat. Deals damage to Necromancers in Horrific Beast, Lich, Vampire, or Wraith forms. Caster’s Karma and Chivalry, and Target’s Fame and Necromancy affect Dispel Chance. 10 20 45 Allows a Paladin to designate the next creature he strikes as a ‘mortal enemy’ causing him to inflict 50% more weapon damage to all creatures of the same type. Damage from other creature types is doubled while the spell is in effect. Duration approximately 1.5-3 minutes, depending on skill and karma. Recasting the spell before it expires will toggle it off. 30 20 65 Allows the Paladin to resurrect, cure and heal all valid targets within 6 tiles of him; healing between 9-24 points of damage based on the caster’s karma. Caster loses all but one 1 point in HP, Mana, and Stamina in exchange. Criminals and murderers are not classed as ‘valid targets’ for this ability.